New images of the European Space Agency’s Beagle 2 have emerged recently, suggesting that it came closer to success than has long been thought. These new images have been analysed more thoroughly and carefully than previous images of Beagle 2, and with the help of a computer simulation it is being suggested that Beagle 2 did not crash land. Instead, this team led by Professor Mark Sims of Leicester University are arguing that Beagle 2 deployed, but not completely correctly. They suggest that, due to not deploying correctly, that it may well have done science for a period of about 100 days, before shutting down due to lack of power. They even suggest that there is a very slim possibility that it is still working. I do have to take issue, however, with the way this story is worded on the BBC website. It implies that we now know, with certainty, that Beagle 2 operated for some period on the surface of Mars. This is not true. One study has argued that it did. One swallow does not make a summer. This particular team’s analysis and study will need to be looked at by others before we can say with any reasonable certainty that Beagle 2 survived its landing. New images of Beagle 2 taken by NASA’s Mars Reconnaissance Orbiter have been analysed by a computer model, suggesting it may have actually worked for a short period of time. As with any suggestion which flies in the face of conventional wisdom, this claim will need to be checked and followed up by others. But, if the evidence is sufficiently strong that Beagle 2 did not crash, then it will come as a relief to those who worked on it and have long felt that it failed in a crash. Sadly, even if it did work, we have not received any data back from it; and that is not going to change. Do GPS satellites move in the sky? Following on from my blog “Is Tim Peake getting younger or older?” , a bit of fun to work out whether time was passing more slowly or more quickly for Tim Peake in the ISS than it is for us on the ground, it got me thinking about the global positioning system (GPS) that so many of us use on a daily basis. Whether it is using a SATNAV in our car, or a GPS-enabled watch to measure how far and fast we have run, or using maps on a smartphone, GPS must be one of the most-used satellite developments of the last few decades. As I blogged about here, communication satellites need to be at a particular height above the Earth’s surface so that they orbit the Earth in the same time that it takes the Earth to rotate. In addition to their altitude, communication satellites can only orbit the Earth about the equator, no other orientation will allow the satellite to hover in the same place relative to a location on Earth. But what about the satellites used in GPS? What kind of an orbit are they in? It turns out that the GPS satellites are not in a geo-stationary orbit, but are in fact in an orbit which leads to their orbiting the Earth exactly twice in each sidereal day (for a definition of sidereal day see my blog here). where is the speed of orbit, is the universal gravitational constant, is the mass of the Earth and is the radius of orbit from the centre of the Earth (not from its surface). Why are GPS satellites in this kind of an orbit? As I didn’t know what kind of an orbit GPS satellites were in before I wrote this blog, the next obvious question is – why are they in an orbit which is exactly half a sidereal day? It is clearly not coincidental! To answer this question, we need to first of all discuss how GPS works. GPS locates your position by measuring the time a signal takes to get to your GPS device from at least four satellites. Your device can identify from which satellites it gets a signal, and the system knows precisely the position of these satellites. By measuring the time the signals take to you reach you from each of the satellites, it is able to calculate how far each one is from you, and then by using triangulation it can work our your location. There are currently 31 satellites in the system, so often there are more than four visible to your GPS device. The current 31 satellites have all been launched since 1997, the original suite of 38 satellites launched between 1978 and 1997 are no longer in operation. As I mentioned in my blog about geostationary satellites, a satellite in a geostationary orbit can only orbit above the Earth’s equator. This would clearly be no good for a GPS system, as all the satellites would lie to the south of someone in e.g. Europe or North America. As I said above, there are currently 31 operational satellites; the 31 are divided into 6 orbital planes. If there were 30 satellites this would be 5 in each orbit. The orbits are inclined at to the Earth’s equator. Each orbit is separated from the other one by 4 hours (equivalent to ) in longitude. As one can see approximately 6 hours in right ascension to both the east and west of one’s location, this means that there will be at least 3 of the orbits above the horizon, and sometimes more. If there were 5 satellites in each orbit this would mean that each one would pass a particular latitude 4 hours before the next one. So, at any particular time there should be some satellites further north than one’s location and some further south, as well as some further east and some further west. This configuration allows for the necessary triangulation to obtain one’s location. Is the time-dilation effect due to SR or GR more important for these satellites? We already showed in this blog that, for the International Space Station, the time-dilation due to Special Relativity (SR) has a greater effect on the passage of time than the time-dilation due to General Relativity (GR). What about for the GPS satellites? Compare this to the value for the ISS, which was , it is less than half the speed. which means that the time dilation due to SR is negligible. , or 22 parts in . Compare this to the ISS, where it was about 1 part in . Clearly the GR effect for GPS satellites is greater, by about a factor of 5, than it was for the ISS. But, conversely, the SR time-dilation effect has become negligible. To conclude, the time dilation for GPS satellites is nearly entirely due to General Relativity, and not due to Special Relativity. Time is passing more quickly for the clocks on the GPS satellites than it is for us on Earth, the converse of what we found for the ISS, which is in a much lower orbit. Because the timings required for GPS to work are so precise, the time dilation effect due to GR needs to be taken into account, and is one of the best pieces of evidence we have that time dilation in GR actually does happen. As of 7:30am BST (06:30 GMT) this morning (Thursday 20 October), it is not looking hopeful for the European Space Agency’s Schiaparelli probe. ESA will make a press announcement at 08:00 GMT, when hopefully we will have a better idea of what has happened. 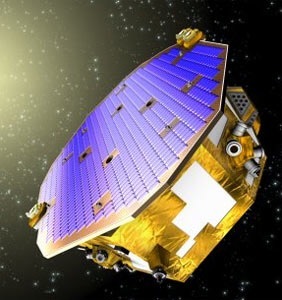 As Schiaparelli was descending it should have been sending telemetry data to its mother ship, the Trace Gas Orbiter (TGO). Those telemetry data were relayed back to Earth overnight, so they should be able to give us a much clearer picture of Schiaparelli’s descent to the surface. A large ground-based radio telescope in India was able to detect some of the signals that Schiaparelli was sending to the TGO, and certain key events such as the parachutes opening seem to have occurred. But, communication seems to have ceased some 30-60 seconds before Schiaparelli was expected to reach the surface. That, and its subsequent silence, are not good signs and the fear is that the probe has crashed during its final descent. I will update this blogpost when we know more, later this morning. In the meantime, keep your fingers crossed. I’ve just finished watching the live ESA press announcement. The bottom line is that we still don’t know what has happened to the probe. From the telemetry analysed, ESA say that the parachute opened, and all seemed fine until the parachute detached. Loss of signal happened about 50 seconds before the expected touchdown. Nothing has been heard from Schiaparelli since. ESA also suggested that they knew that the rockets to slow its final descent had fired, but at this point in time they do not know how many of the rockets fired or for how long. In addition to various satellites which are in orbit around Mars, in addition to the TGO, trying to communicate with Schiaparelli, NASA’s Mars Reconnaissance Orbiter will take images of the landing site to try to find the probe. The same satellite successfully spotted Beagle 2 a few years ago after it went missing in 2003. ESA very much put a positive spin on events, emphasising the success of the TGO, and that the telemetry data from Schiaparelli’s decent should help them fully understand what went wrong. They therefore feel that its possible failure should not alter the schedule to send the ExoMars Rover in a few years. I will blog more about the science that the TGO plans to do next week, and give an update (if there are any development) on Schiaparelli. Tomorrow (Wednesday 19 October) the European Space Agency (ESA) will attempt to land its probe Schiaparelli on the surface of Mars. Schiaparelli is named after the 19th Century Italian astronomer Giovanni Schiaparelli who is most famous for observing “canali” on the surface of Mars in 1877. Whereas the word means “channels” in English, it got mis-translated as “canals”, and led to a furore of interest in the possible existence of artificial irrigation channels which it was suggested had been built by Martians to transfer water from the poles to the arid equatorial regions. All of this was, of course, wrong; but it led to a surge of interest in Mars, including Percival Lowell establishing his observatory in Flagstaff and spending decades observing the red planet. It was this observatory which in the 1910s found the first evidence for the redshift of spiral nebulae (Vesto Slipher), and where, in 1930, Pluto was discovered. Tomorrow (Wednesday 19 October) the European Space Agency will attempt to land its probe Schiaparelli on the surface of Mars. ESA has only attempted once before to land a spacecraft on the surface of Mars; Beagle 2 crash landed in December 2003 and failed to operate. Schiaparelli is a 600-kg lander which is being transported to Mars by its mother ship, the Trace Gas Orbiter. Both are part of ESA’s ExoMars project, which will put a rover on the surface of Mars in 2021. 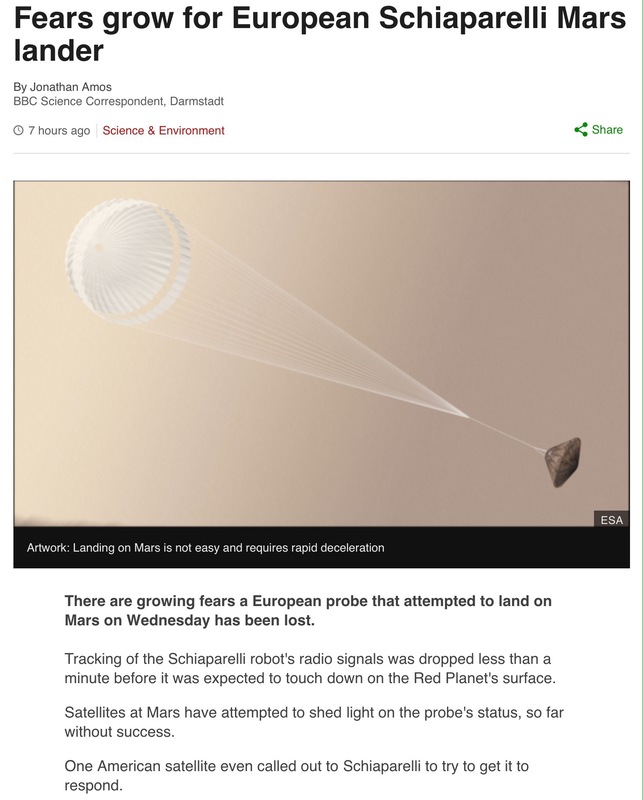 Schiaparelli is what is referred to as a “demonstrator”, as its purpose is to test various technologies for the landing of the ExoMars rover in 2021. It is planned that Schiaparelli will only operate for a few days, but I suspect that it will end up operating for longer than this. Let us hope that it has a better landing that Beagle 2! Later this morning (Monday 4 July) I will be on BBC radio talking about NASA’s Juno mission to the planet Jupiter. This is the latest space probe to be sent to study the largest planet in the Solar System, and follows on the highly successful Galileo spacecraft which studied Jupiter in the 1990s. Juno left Earth in August 2011 and is due to arrive at Jupiter today. But, in order to go into orbit about the planet a rocket needs to be fired to slow the spacecraft down and put it into orbit. This is due to happen tomorrow (Tuesday 5 July). The rocket engine which will do this was built in England. If the ‘burn’ fails, the mission will fail, as the space probe will just hurtle past Jupiter and continue on into the outer Solar System. NASA’s Juno satellite was launched in August 2011 and arrives at Jupiter this week. It will be put into a polar orbit about the planet, but with a highly elliptical orbit which will take it out beyond Callisto’s orbit. Each orbit will take 14 days. What are Juno’s scientific objectives? In addition to studying Jupiter, the Galileo spacecraft spent a great deal of time studying her four large moons; Io, Europa, Ganymede and Callisto. Galileo was in an equatorial orbit. Juno, on the other hand, will be put into a polar orbit. Its main objective is to study Jupiter, rather than its moons. Jupiter is what is known as a gas giant. It is mainly hydrogen, and contains more mass than all the other planets in the Solar System put together. In fact, it is a failed star; if it were some 10 times more massive it would have had enough mass to ignite hydrogen fusion in its core. Even though it is not burning hydrogen, it is still leaking heat left over form its collapse into a planet 4.5 billion years ago. In the last 20 years we have discovered many Jupiter-like planets orbiting other stars. Most of these are much closer to their parent star than Jupiter is to the Sun, and this has raised questions about how gas giants can be so close to their parent star, and how is Jupiter where it is in our Solar System? Jupiter is about five times further away from the Sun than the Earth is, and much further away than the Jupiter-like planets we have found around other stars. Did Jupiter start off closer to the Sun and get kicked further out, or did it migrate inwards from further away? We don’t know. the ratio of oxygen to hydrogen in Jupiter’s atmosphere. By determining this ratio it will effectively be measuring the amount of water, which will help distinguish between competing theories of how Jupiter formed. the mass of the solid core believed to lie at the planet’s centre, deep below the very thick and extensive atmosphere. This also has implications for its origin. the internal structure of Jupiter – it will do this by precisely mapping the distribution of Jupiter’s gravitational field. its magnetic field to better understand its origin and how deep inside Jupiter the magnetic field is created. the variation of atmospheric composition and temperature at all latitudes to pressures greater than 100 bars (100 times the atmospheric pressure at sea level on the Earth). Juno has a funded operational lifetime of about 18 months. In order to better study the interior of Jupiter, the spacecraft will plunge into the planet’s atmosphere in February of 2018, making measurements as it does so. Juno’ rocket successfully fired at about 3:20 UT today (Tuesday 5 May) and is now in orbit about Jupiter. It will complete two large 53-day orbits before being inserted into its 14-day orbit for science operations. This 14-day orbit is highly elliptical, and at its closest the probe will come to within 4,300 km of the cloud tops. A few hours ago the European Space Agency (ESA) launched a satellite which will hopefully lead to our being able to detect ripples in space. 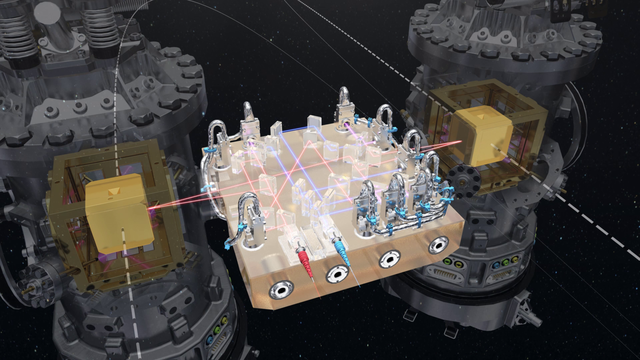 The LISA Pathfinder satellite took off from French Guiana just after 4am GMT, and its purpose is to test the feasibility of a far more ambitious experiment called LISA which will be launched in the 2030s. There are ground-based experiments to detect gravitational waves (the ripples in space that I referred to above), but doing such experiments from space should provide more sensitivity. These waves are a prediction of Einstein’s theory of gravity, the general theory of relativity. We are yet to detect any gravitational waves, but as I explain in my book on the cosmic microwave background, detecting them will provide us with another way of measuring properties of the Universe. In some ways, rather than seeing the Universe, we would be able to feel it.